Meet the Artist is back! 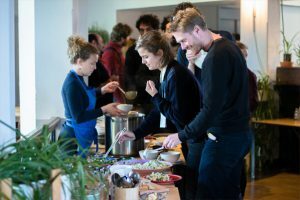 On Monday the 21st of January 2019, four young, remarkable Middle Eastern performance artists open their studios in Het Huis Utrecht for a peek in their kitchens. What’s cooking? How is it made? And more importantly: does it whet our appetite? 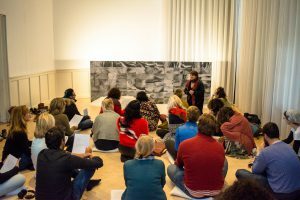 After a successful first edition of Meet the Artist in 2017, Dancing on the Edge and Het Huis Utrecht join forces for Meet the Artist #2, with new promising artists: they invite you to look at their new work-in-progress and give constructive feedback. All four artists are currently based in Europe, where they look for new artistic forms, focus on current topics and issues, with a personal and original vision. 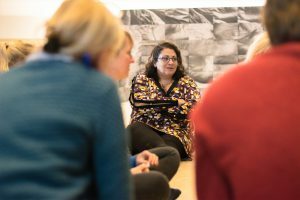 As they look to connect to each other, the audience and the local professional scene in Europe, they are open to a dialogue with the goal to innovate. Join them and broaden your horizon. Farah Saleh, a Palestinian dancer and choreographer active in Palestine, Europe and the US. She teaches dance, coordinates and curates artistic projects since 2010. She has won several international awards and is currently an Associate Artist at Dance Base in Edinburgh, UK. 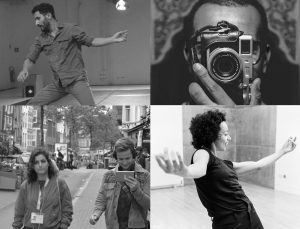 Saleh will present her ongoing research on the Archive of Gestures with a performance lecture, using text, video and dance. Hilda Moucharrafieh, a Lebanese artist living and working in Amsterdam. Her background is in design and scenography with a focus on collaborative ways of working. She works through performance and performative structures under the operating name The NarrativeCollective. In 2018, she won the International Bursary Award. During Meet the artist Moucharrafieh will be presenting her collaborative practice-based research on the influence of technology, history and capitalism on movement in the public sphere. Muhcine Ennou, a self-taught Moroccan artist, recently moved to the Netherlands and seeking to explore the subtleties of everyday life. He has a specific interest in sociology and ethnography that play a key part in his artistic practice of capturing these socio-cultural nuances. During Meet the Artist he will present part of his research of self-image and observation of how see ourselves through photography. Youness Aboulakoul, a Moroccan dancer and choreographer in Paris. After having worked with names like Olivier Dubois, Radhouane Elmeddeb, Ramon Baeza, Bernardo Montet, and Christian Rizzo and making the successful The Architects with choreographer Youness Atbane, he is currently developing his first solo work Today is a beautiful day. This will premiere at Dancing on the Edge Festival in November 2019. At Meet the Artist he will present the result of his first movement research residency about the resonance of the violence. 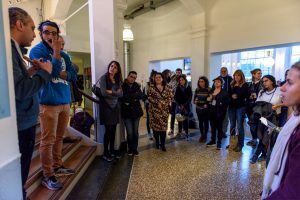 Besides the open studios, Meet the Artist #2 has a context program with masterclasses, food, a talk and the performance Without Damage by Mohamed Fouad. The talk will be moderated by Chris Keulemans, in which he, the artists and the audience reflect on the day and talk about the accessibility of the European cultural sector and professional field from a personal point of view. Subscribe to our newsletter at the bottom of this page or follow the Facebook event to receive updates on the program. There will be a dinner option between 18:00 and 20:00. The price is €15 and has to be booked in advance. If you buy a dinner ticket, we will get in touch about dietary wishes later. All tickets for the Monday program are available here. Registration for the masterclass happens here.